As helpful as it is, I think the internet is a bit overrated. Sure, you can find out all sorts of useful and, mostly, non-useful information. However, a while back my sister Judith brought up the fact that she was unable to find a picture of a Fat Frog ice cream bar online. My first thought was one of arrogance. “Maybe you can’t find it, but I can.” But I couldn’t. All I could find were pictures of actual fat frogs. Which are certainly interesting, just not what I’m looking for. If it doesn’t contain easily found pictures of Fat Frog bars, what good is the internet? Another failure of the internet is its inability to provide any help when searching for information on Disney World. When you go to Google and search Disney World, there’s just nothing. It’s bad enough there’s no television advertising. Disney currently has a promotion where you get free park admission on your birthday. With an idea this great, you would think they would want to place an ad during every commercial break of every show on TV. Since it is impossible to find any web sites with Disney information, either official or fan made sites, I thought I should at least offer some insight. One thing you might not be aware of when it comes to Disney World is that there are actually a lotof ways to spend money while on vacation. If you pay enough attention, you will be able to find the occasional shop that sells a few assorted items emblazoned with the Disney logo or Mickey’s head. The gift shops aren’t easy to find, but they are there. Trust me. If you look even more closely, you will be able to find some places where you can purchase food and beverages. There are a lot more locations than you might expect, if only because Disney does such a good job of hiding them. As a reward for reading this, I am going to let you in on a secret. If you want to find one of the gift shops or food stands in a Disney park, just follow this method. Stand anywhere in any park, and look either three feet to your left or right. There you go! Now that you are aware of where to get food, the bigger question is, what to eat? That is a surprisingly tough question to answer, for a couple reasons. Mostly, it is because Disney World has literally hundreds of places to eat. Also, it is because I always get the same things every time, and am too much of a wimp to try new things. So this isn’t going to be any sort of “Official Best Snacks at Disney World” list. For one thing, I don’t even know how to get a list made official. Another reason is that there probably are better things to get, I’ve just never gotten them. I wasn’t sure whether I should do top ten, five, or what. I then thought I would settle on seven, in a tribute to the best show on TV in Florida, “Top Seven Must Sees: Walt Disney World”. However, I’m pretty mad at them. The last couple of trips have nearly been ruined by the new host, Stacey. She is the worst. At everything. Now, whenever you want some Top Seven action, you are subjected to the worst human being alive: Stacey. So I’m not going to do a top seven list, in protest. Unfortunately, I didn’t want to do a top five, because I had at least six things I wanted to mention. You’re in for a treat, lady and gentleman. You are about to witness one of the rarest feats in the fast paced world of making lists: the elusive Top Six. Is that not the worst title logo you have ever seen? I’m rather proud of its awfulness. 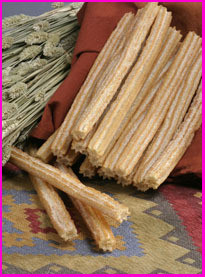 The good thing about writing about Churros is that they have already done all the work for me. I don’t have to explain why churros are good. Unfortunately, they’re also not very exciting to write or read about. They’re essentially an extra crispy, long donut. Except with that cool ridged surface. And with cinnamon sugar. So forget about reading this description, just close your eyes and imagine you were eating a churro instead. I’m not picky with water. Of course given the option, I’d rather choose bottled or filtered water. However, I’m usually fine with some tap water if that’s all there is. I don’t know what the deal is with the water in Disney World’s fountains. The water is like that weird “unfiltered” apple juice, the cloudy stuff. I mean, I don’t like apple juice anyway; but that unfiltered juice is just creepy looking. But the Disney water is just awful. The tap water in the rooms isn’t terrible, so I don’t think it’s the water source. I’ve heard people recommend that you can save money in Disney World buy only buying one bottle of water and just refilling it in the fountains. Don’t do this. As far as the beverage I’d suggest as a replacement, it doesn’t matter too much. I usually have soda around the way a baby has a bottle around, so I’d probably say go with that. Or if you’re in Epcot, go into the Club Cool and get some free soda. And if you’re one of those people that think you “shouldn’t drink soda all day long”, buy a bottle of water. 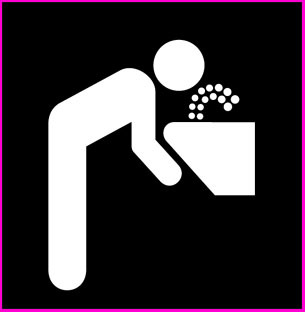 Just stay away from the fountains. Stay far away. You don’t even want to step in the puddle that forms near them. Nuts are one of those foods you’re never sure if they’re okay to eat or not. You know they are ridiculously high in fat, but you’ve also heard that it’s “good fat”. Here’s a good way to take out all the guesswork: to make it clear that they are something not okay to eat, just take a handful of nuts, and coat them in a thick layer of sugar. Problem solved! Because come on, who wants to eat “real food” at Disney World? Okay, probably a lot of people. Other people. Oddly enough, I had never actually bought these at Disney World until my last trip. I have had them before, and am a big fan. You always see these carts in New York City, which is sort of the Disney World of real life. 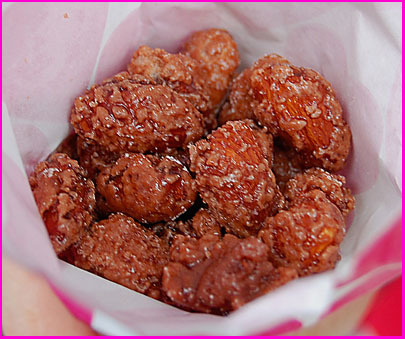 Once my goth friend Dersh bought a bag of cinnamon glazed coconut pieces from one of these vendors. They were quite good, but were one of those foods you’re glad someone else bought, since one piece was pretty much all you could imagine eating. This sickly sweet flavor stuck with me, and kind of turned me off to ever buying “cinnamon glazed” anything. During our last trip, Amy and I were on line for a ride, behind someone who had bought them. So the entire time we were waiting, this intense scent surrounded us. After getting off the ride, we decided we wanted to try them, possibly due to the subconscious suggestions from our clothing, which most likely still smelled like cinnamon glaze. This is definitely one of those Disney World snacks that you can’t justify having too often. I guess most snacks are hard to justify having too often, but I’ve gotten pretty good at that. This is one of my most cherished Disney World traditions. Every trip, I get a bag of Jelly Belly beans from one of the candy stores, and try to stretch them to last me the whole trip. Unfortunately, I haven’t gotten any smarter when it comes to buying them. As anyone who has ever bought pound candy knows, that price goes up fast. “$2.50 for every one sixth of a pound? That seems reasonable, I’m probably only going to get like a tenth of a pound anyway.” Then you go and weigh your bag and it comes to like fifteen dollars. I do know this, and it doesn’t help. 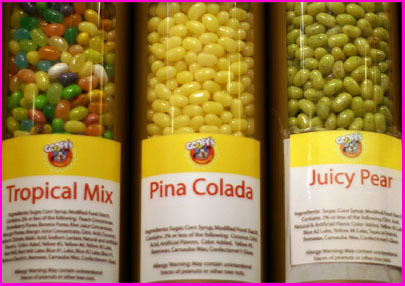 I know that in order to get all the jelly bean flavors I want, I have to only take a little of each. And yet there I go, right to Juicy Pear and dump a ton in my bag. Then I look two flavors to the left, see peach and throw more in. After putting too much in the bag and walking away, I see that I didn’t notice they had pineapple, and put more in the bag. Considering I’m probably paying about thirty cents a bean, I need to figure out a better system for picking them out. I have discussed these here before, and every time I mention them the news gets better. The last time I brought them up, it was to share the joyous news that you could now get them at a few select carts around the Magic Kingdom. Now I am pleased to announce that they can now be found at every ice cream cart in Disney World. The doubters have been crushed. If anyone knows that progress can’t be stopped, it is Walt Disney. So the only two plausible reasons for the influx of bananas is either that Walt Disney is reaching out from beyond the grave, or that my web site has the power to influence the Disney company’s decisions. Which option sounds more possible? That’s right, ghost Walt Disney is getting things done. 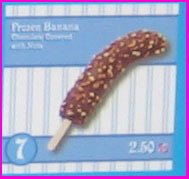 Not only are chocolate bananas an incredible snack, they are so easy to write off as not even that bad for you. Yes, they are covered in chocolate and crushed peanuts. Just ignore that part. So basically you’re just eating a banana. Also, they might just help you avoid a frightening encounter with a bathroom stall in the park. While I know that ghost Walt is the main reason for bananas now being available everywhere, I couldn’t help feeling some pride. Every time I would see someone walking around eating one, I gave them a silent “You’re welcome.” And yeah, they might have found it odd that I was staring at them while mouthing words. But deep down, they felt gratitude. Pineapple Floats are alongside frozen bananas on this list in the category of “Things I’ll be angry if I don’t get.” I’m not really sure how often you can have a pineapple float, since as snacks go, they’re pretty epic. They’re also one of the more expensive snacks, so you might have to limit your consumption to ten or so a day. These cups of love are certainly the most refreshing snack you can get. The hotter and more disgusting the weather, the better they taste. 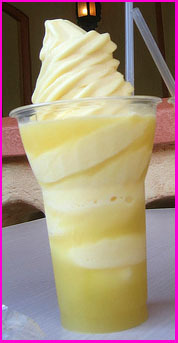 Not only do you get the incredible pineapple soft serve, it comes atop a deep pool of pineapple juice. Juice! So really, you can have as many of these as you want, since they’re high in vitamin C. And as the nearby Pirates of the Caribbean attraction should remind you, you need that vitamin C to ward of scurvy. 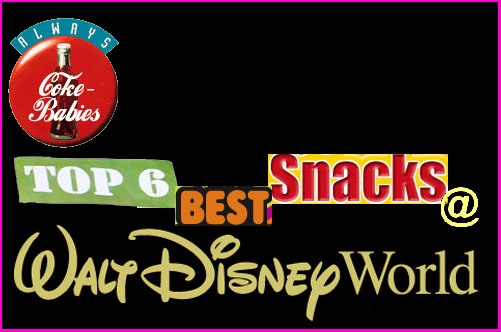 And thus concludes our hard hitting exposé on Disney snacks. Unfortunately, as far as my writing is concerned, “hard hitting” is just another way of saying “less lazy and poorly thought out than usual”. So I recommend every item on this list; they all have my personal seal of approval (which is a drawing of me giving a thumbs up done in MS Paint). That said, I’d recommend trying everything you can in the parks. There are tons of legitimately good things to eat, and it is an easy way to get rid of all that money you’re always complaining you have too much of.